Following the loss of his mother to breast cancer, Dr. West's mission became clear: to provide world-class cancer treatment and research capabilities in his hometown. William H. West, MD, was a nationally respected oncologist and lead investigator for the National Institutes of Health in Washington, D.C. Following the loss of his mother to breast cancer, his mission became clear: to provide world-class cancer treatment and research capabilities in his hometown of Memphis, Tennessee. In 1979, Dr. West’s goal became reality, and the doors of what would become West Clinic officially opened. A chance meeting shortly following the opening further cemented the foundation of West Clinic. 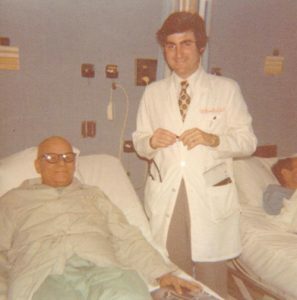 Kurt W. Tauer, MD, FACP, was a resident at a hospital in Memphis, Tennessee, assigned to a colon cancer patient of Dr. West’s. 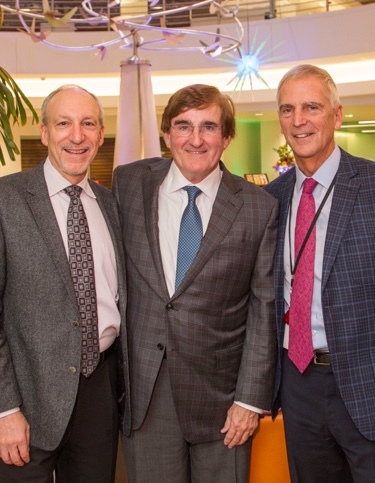 They quickly established a partnership – and friendship – that would bring Dr. Tauer back to Memphis following his fellowship in Medical Oncology at Memorial Sloane-Kettering in New York City. In almost predictable happenstance, Dr. Tauer’s across-the-hall neighbor in New York City and fellow resident at Memorial Sloane-Kettering – Lee S. Schwartzberg, MD, FACP – would eventually join Dr. Tauer and Dr. West at West Clinic to form a powerful partnership of physicians dedicated to improving cancer care and overall health in the Memphis community. Today, West Cancer Center is positioned as the region’s comprehensive leader in adult cancer care and research. This focus on groundbreaking research and clinical trials provides West Cancer Center patients with the most effective, individualized care possible. It is what sets West apart – and it is why patients from throughout the region and across the country choose West Cancer Center as their trusted partner in their cancer journey. As a member of the National Comprehensive Cancer Network, West Cancer Center embraces the mission to improve quality, effectiveness, and efficiency of cancer care for all patients regardless of regional location and socioeconomic status. Our commitment to translate cancer science into revolutionary treatment protocols is furthered by the enrollment of 500 patients in clinical trials in 2018 and over 4,210 analytic cases recorded to the tumor registry annually. Focusing on genomic/drug delivery, translational targeting, and new clinical pathways also provides patients with the latest, most innovative, personalized cancer treatment plans. West Cancer Center’s dedication to clinical excellence extends beyond conventional care with programs and services that focus on the mind, body, and spirit to improve overall wellness and outcomes. Our mission is to provide innovative, superior adult cancer care with a singular focus on physician-driven decisions to do what is best for patients, this community, and the future of cancer care. We remain steadfast to take care of all cancer patients with programs and services to improve overall wellness – regardless of socioeconomic status. Our vision is to expand our reach and reputation as the region’s premiere adult cancer center by partnering with like-minded, patient-centric, technology-powered community oncology practices throughout the country.